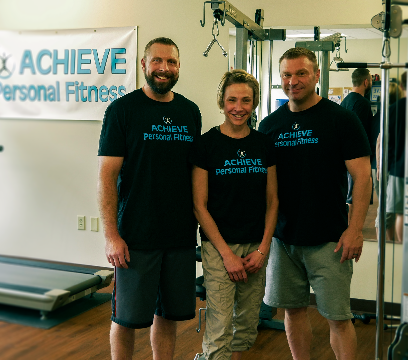 All of the trainers here at ACHIEVE are very knowledgeable with years of experience in health and fitness. Along with certifications from organizations such as the National Academy of Sports Medicine and the American Council on Exercise, they have also acquired specialties in such areas as Women's Fitness Specialist, Corrective Exercise Specialist, Sports Performance Enhancement Specialist and Cardio for Sports Performance. ​The single most important element of an exercise program is that the client must enjoy doing it. A fun exercise program makes it much easier to stay on track and be consistent. To help accomplish this, we can accommodate a variety of exercise modalities. We can incorporate exercises that keep the workouts fun and something to look forward to rather than dread. With an experienced MMA fighter (a purple belt in Brazilian jujitsu) as part of our team, we can work in some heavy bag work, boxing, kickboxing, muay thai, focus mitts, etc to keep things fun. We also have a trainer that competes regularly in numerous marathons and triathlons, including an annual run in the Boston Marathon. If you're a runner and looking to improve, we have the knowledge and experience to help you ACHIEVE your goals. A total approach to your training. These balls bring the medicine you need! Call or Stop in to get started! Check out our home page for the current Special!